According to Rudolph (2004) and Holmes (2002), the evolution of technology in the twentieth century had a huge impact on music. Holmes declared that music, as we know it today, would not exist without technology. In fact, a new music, called electronic music, evolved in the twentieth century parallel to this technological evolution. When defining electronic music, Chadabe (1997) declared that “Electronic music includes all music made with electronics, whether specifically with computer, synthesizer, or any other special equipment” (p. x). More specifically, Holmes (2002) stated, “Electronic music is created through the generation of sound waves by electrical means” (p. 6). Chadabe acknowledged terms synonymous to electronic music such as computer music, synthesizer music, and electroacoustic music. The introduction of electronic music into higher education in the United States occurred around 1960. Teachers and students at institutions such as Columbia-Princeton Electronic Music Center at Columbia University and the Mills Tape Music Center at Mills College used synthesizers and magnetic tape for composing electronic music. During the 1970s, an ever-growing number of universities and colleges implemented music technology programs and acquired sophisticated electronic music labs complete with synthesizers and tape recorders. This was “a response for the need for a more formalized and comprehensive training of recording engineers, electronic musicians, and composers” (Mager 1997). The purpose of this study is to report the technical facilities used for introductory electronic music in United States universities offering an undergraduate degree in music production and technology. The researcher collected data about the technical facilities for the first hands-on electronic music course offered to students at these institutions during fall semester of 2005. The primary piece of hardware for an introductory course in electronic music was a personal computer. Manning (2002) acknowledged that by the year 2000, an industry dominated by hardware products was fast becoming more supportive for computer-based systems offering facilities based on software rather than hardware. The personal computer had become the central hub for an electronic music studio. The primary software was a MIDI sequencer. The MIDI sequencer was popularized in the mid-1980s as a means to record, edit, and play back MIDI data in a format similar to a multi-track tape recorder. Mager (1997) and Terrell (2001) reported the MIDI sequencer as the most common MIDI software used in music technology programs. During the decade of the 1990s, increase in computer processing speed allowed the recording of digital audio with MIDI sequencing software resulting in the digital audio workstation. Other hardware for an introductory course in electronic music included synthesizers, MIDI sound modules, and samplers. However, this hardware became replaceable by software in the twenty-first century (Williams 2006). This study offers aid to teachers and administrators in the process of developing, or currently teaching, an introductory course in electronic music. The results provide ideas for technical facilities needed for a new or existing course. In addition, this study offers aid to manufacturers, publishers of textbooks, and other businesses interested in serving educational institutions. Digital Audio – The conversion of a continuous wave to discreet samples with an analog-to-digital converter, and then the reproduction of the samples back to the analog continuous wave with a digital-to-analog converter. MIDI – An acronym for Musical Instrument Digital Interface, MIDI is a digital communications language and compatible hardware specification that allows multiple electronic instruments, performance controllers, computers, and other related devices to communicate with each other over a connected network (Huber 1999, p. 1). MIDI Sequencer – Software or hardware for recording and replaying MIDI data, usually in a multi-track format, allowing complex compositions to be built up a part at a time (White 2002). During the mid-1990s, MIDI sequencers added the capability to record digital audio and were referred to as digital audio workstations (Ballora 2003). MIDI Sound Module – A MIDI device, typically rack-mounted, that is a synthesizer or sampler minus the physical keyboard. Sampler – An electronic or software-based musical instrument similar to a synthesizer but is different in the fact that it allows the user to make digital recordings of external sound sources (Millward 2002, Vail 2000). Synthesizer – An electronic or software-based musical instrument specialized in the creation of a wide range of tones and sound textures beyond those encountered in conventional musical instruments. A synthesizer is normally endowed with a performance interface (a musical keyboard), a control interface (GUI or front panel controls), and a synthesis engine (sound processing circuitry) (Millward 2002, p. 273). 1)	Universities in the population were limited to those listed in the Audio Engineering Society’s Directory of Educa- tional Programs. 2)	Universities in the population were limited to those located in the United States. technology. 4) Data, obtained with a self-administered survey instrument created by the researcher, were collected during fall of 2005. What technical facilities were used for introductory electronic music during fall of 2005? No scientific research on electronic music courses in higher education exists. However, there are two closely related studies. Mager (1997) investigated the status of MIDI as part of the curricula of higher education institutions offering degree programs in music. In another study, Terrell (2001) investigated the impact of digital audio in United States higher education audio recording technology programs. Although neither study investigated electronic music, both investigated MIDI and recording technical facilities used in higher education programs. Mager found that 92.6% of music departments had at least one com-puter-assisted instruction (CAI) or MIDI workstation and 59.6% had at least one recording studio. All music departments with a music technology program had at least one recording studio. Terrell concurred that all recording technology programs had a MIDI lab and an average of 2.3 recording studios. Regarding computer platform, the Macintosh was indicated as the predominant platform. Mager reported that 81.6% of music programs used the Macintosh platform while 14.7% used Windows. Other platforms, such as Atari and UNIX, were used by 3.7%. Similarly, Terrell reported that 65.2% of recording technology programs used Macintosh only, 8.7% used Windows only, and 26.1% used both. Regarding computer applications, Mager reported music departments most often used MIDI sequencing and notation programs. Terrell reported that recording technology programs most often used computers for MIDI sequencing (97.6%) and audio editing (90.5%). This was a qualitative study that used a descriptive methodology. The researcher collected data with a self-administered questionnaire to determine the current state of technical facilities used for introductory electronic music. The population for this study included 59 United States universities that offered an undergraduate degree listed in the AES Directory of Educational Programs. This directory was located at www.aes.org and was a comprehensive international guide to educational programs in music production and technology programs (Rumsey 2005). The total population of 59 was reduced to 54 because one university participated in the pilot study and four others did not currently offer a course in introductory electronic music. Data were collected with a self-administered electronic questionnaire designed by the researcher. Following a pilot study, the questionnaire was refined and delivered in an online format to all 54 participants in the population. In order to find the appropriate people to participate, the researcher looked for the instructor of the first hands-on introductory course in electronic music offered to students at each university. Once found, all the instructors were contacted by email with a request to complete the online questionnaire. 44 of the 54 responded. 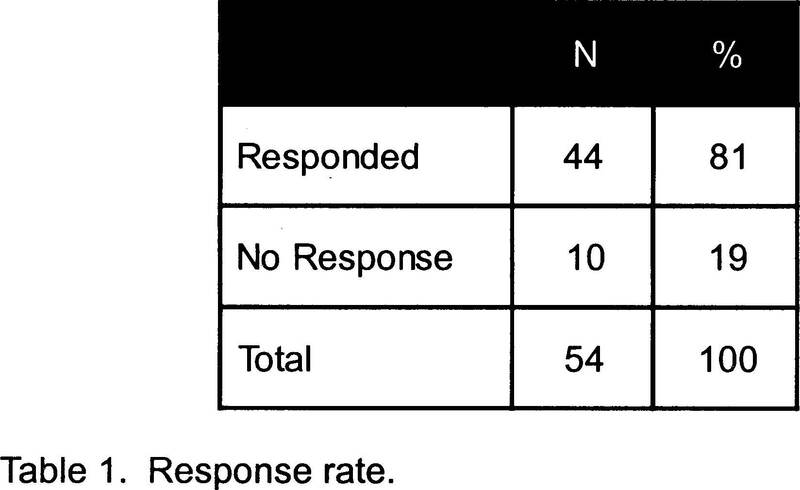 This represented a response rate of 81.4% of the total population (see table 1). The participants reported the course title for the first hands-on course in electronic music offered at their institutions. Appearing most often, Introduction to Music Technology was reported by five participants. Other recurring titles were Introduction to Computer Music and Introduction to MIDI. The required prerequisite(s) for the course were reported. Nineteen (43%) reported no prerequisite, while 25 (57%) reported one or more prerequisites. 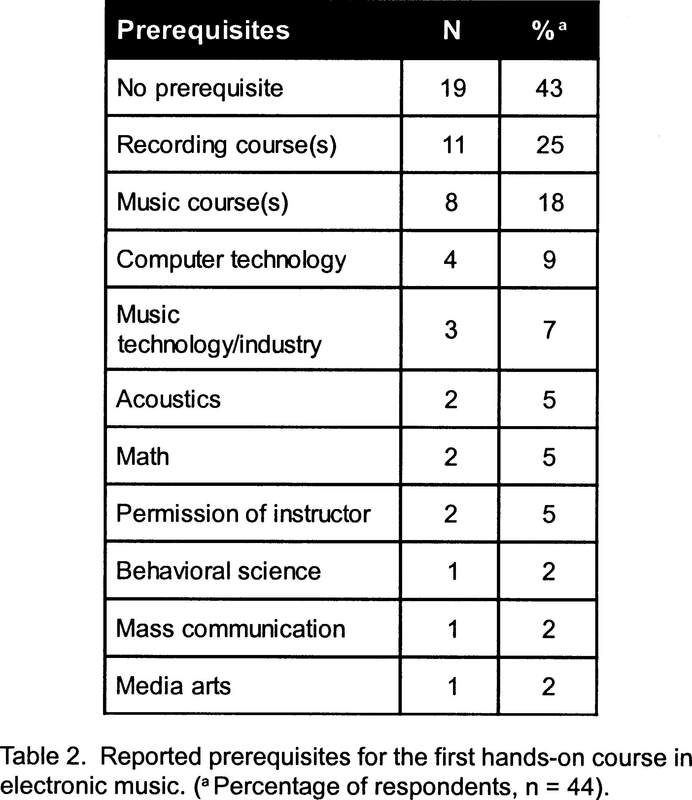 One fourth (25%) of the respondents indicated one or two courses in the discipline of recording (e.g., recording fundamentals), and less than one-fifth (18%) indicated one or more music-related courses (e.g., class piano, music theory, or composition). Table 2 lists the reported prerequisites. The specific type of program or baccalaureate degree in which the course was a curricular requirement was reported. 41 (93%) verified that the course was a requirement for one or more baccalaureate degree programs at their universities. More than one half (59%) reported a degree in recording/production, less than one third (30%) reported music composition, and one fourth (25%) reported music technology. Six (14%) stated the course was required for most or all of the music degrees offered by their universities. 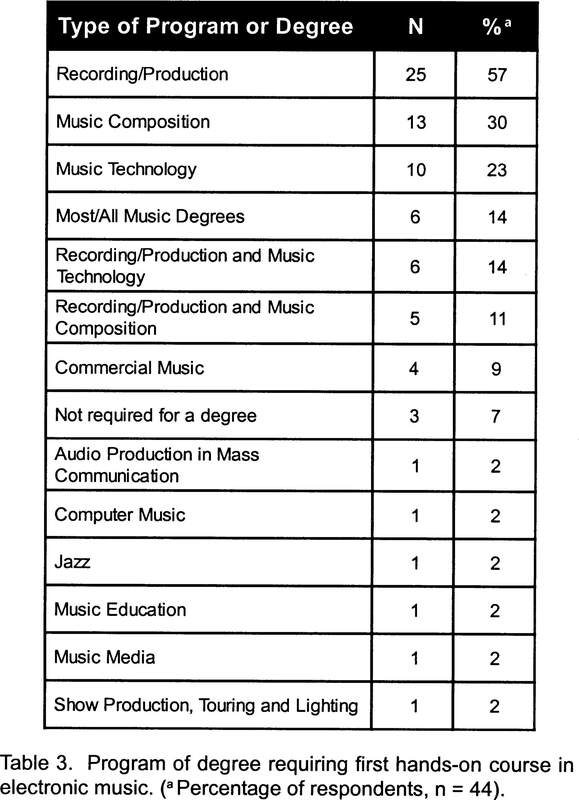 In addition, six (14%) reported recording/production and music technology, while five (11%) reported recording/production and music composition (see table 3). Participants were asked to report which operating systems were used for the course. A majority (93%) reported Mac OS, one-fifth (20%) reported Microsoft Windows, and one institution (2%) reported an “other” operating system. Six (14%) reported using both Mac OS and Microsoft Windows. 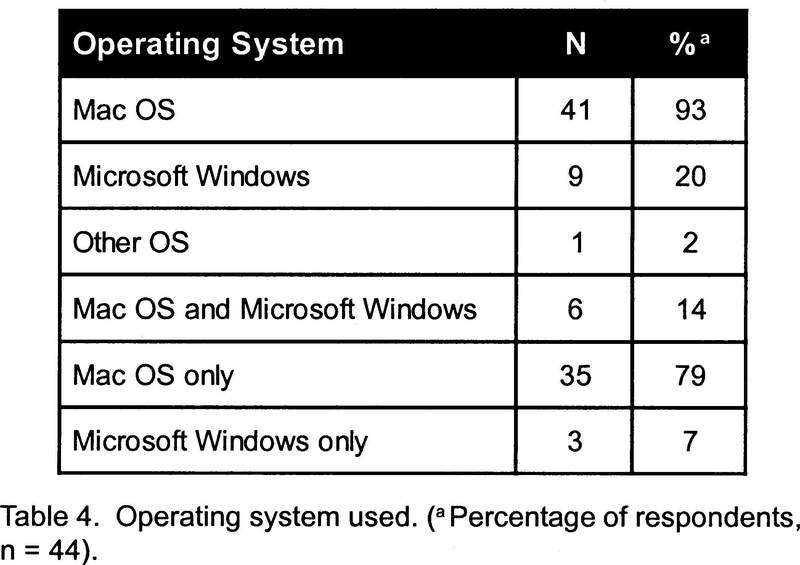 For the participants that reported only one operating system, a majority (79%) reported the Mac OS and only a few (7%) reported Microsoft Windows (see table 4). The participants were asked to report how many computer stations were available to students enrolled in this course. The results were diverse. Nevertheless, less than one half (41%) reported having one to five stations, and one fourth (25%) reported having 21 stations or more. For the six participants who reported using Mac OS and Windows, one half (50%) had the same number of computer stations for each operating system while the other half (50%) had a higher number of computer stations for the Mac OS. One participant reported using one to five stations for an “other” operating system. 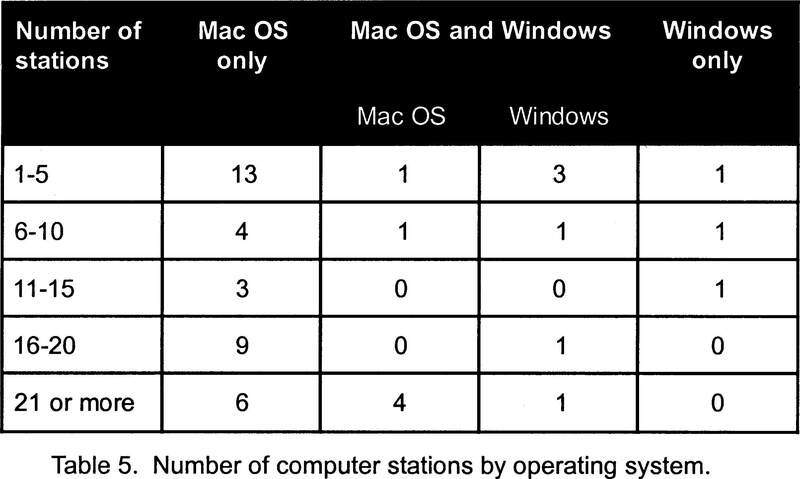 Table 5 illustrates the number of computer stations by participants who used Mac OS only, Mac OS and Windows, and Windows only. The 41 participants who used Mac OS were asked to report all the reasons why they chose Mac OS. Approximately three fourths (73%) selected recording industry standard as a reason while 71% stated they chose Mac OS due to instructor familiarity. Less than two thirds (61%) stated available resources, less than one half (49%) reported Mac OS as the only platform for selected software, and one fifth (20%) stated it was recommended to them. Other responses included “stability and ease of operation,” “virus free,” “superior OS,” “Macs used to be the only choice,” “best option for certain applications,” “compatibility with other Macs in the department,” and “only platform and industry standard may be less applicable now than when lab was originally set up years ago” (see table 6). The nine participants who used Microsoft Windows were asked to report why they chose Windows. Two thirds (67%) selected available resources as a reason while less than half (44%) stated that Windows was the only platform for selected software. One third reported cost as a factor, more than one fifth (22%) confirmed available tech support, and more than one fifth (22%) indicated instructor familiarity. Other responses included “best option for certain applications,” and “technology was in place when I arrived. Comfortable with PC, but use Macs at home” (see table 7). Comparing Tables 6 and 7, recording industry standard and recommendation was reported by Mac OS users, but not by any Windows users. In contrast, cost and available tech support was reported by Windows users, but not by any Mac OS users. The participants were asked to check which Digital Audio Workstations (DAW) were used for this course. More than one half (59%) reported Digital Performer, less than one half (45%) reported Pro Tools, and less than one third (30%) reported Logic Pro. 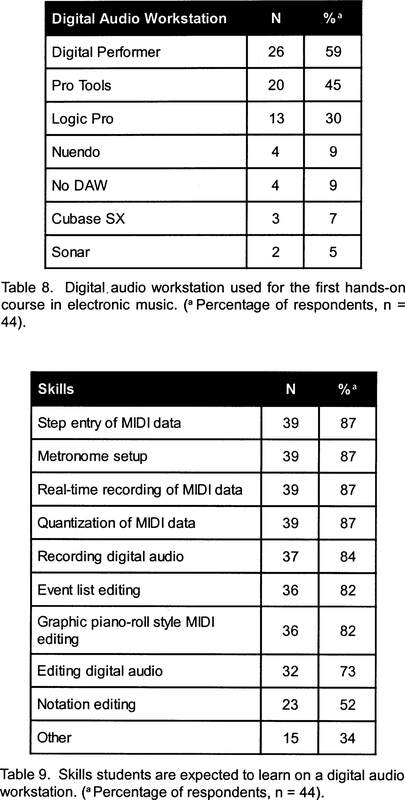 A small number reported Nuendo, no DAW, Cubase SX, and Sonar (see table 8). The participants using a DAW were asked to report what skills students were expected to learn. A large majority of the participants selected all the options available with the exception of only slightly more than one half (52%) reporting notation editing (see table 9). Participants were asked to report which virtual instruments, software synths/samplers, and virtual rack programs were used for this course. Nine (20%) reported that no such application was used while 35 (80%) reported one to eight different titles. The participants were given the option to check fifteen different titles. More than one half (55%) checked Reason, more than one fourth (27%) reported other titles not on the list, and less than one fourth (23%) checked Absynth. Less than one fifth checked Kontakt (18%), and less than one fifth (18%) checked Reaktor (see table 10). In addition to the fifteen selectable titles cited in table 10, twelve participants reported nineteen other titles. This produced a total of 34 different titles, and reveals that a wide assortment of applications was used. Table 11 lists the nineteen other titles reported. Participants reported other software used for this course. Six (14%) reported no other software while 38 (86%) reported one to ten titles. Over one half (52%) of the respondents reported Toast, more than one third (37%) reported Peak and more than one third (36%) reported Finale. More than one fourth (27%) reported GarageBand while less than one fourth (23%) reported Max. 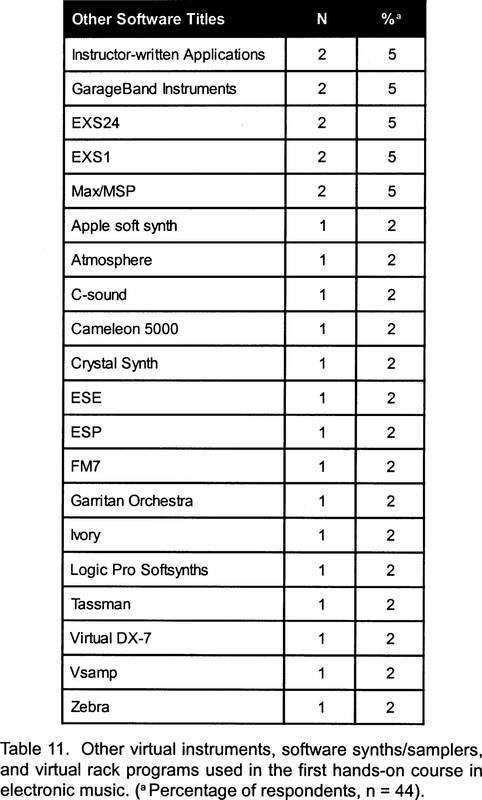 Other responses included “Audacity,” “Deck,” “DSP Quattro,” “DreamWeaver,” “Fruityloops,” “iTunes,” “MetaSynth,” “MIDIquest Lib/Ed,” and “plug-ins such as Waves, McDSP and Sony EQ” (see table 12). Participants were asked to name the primary type of keyboard controller used at each computer station. 36 (82%) reported one type of keyboard while six (14%) reported two or more types. Two reported no keyboard. Over one half (52%) of the respondents reported a synthesizer with an internal sound engine. 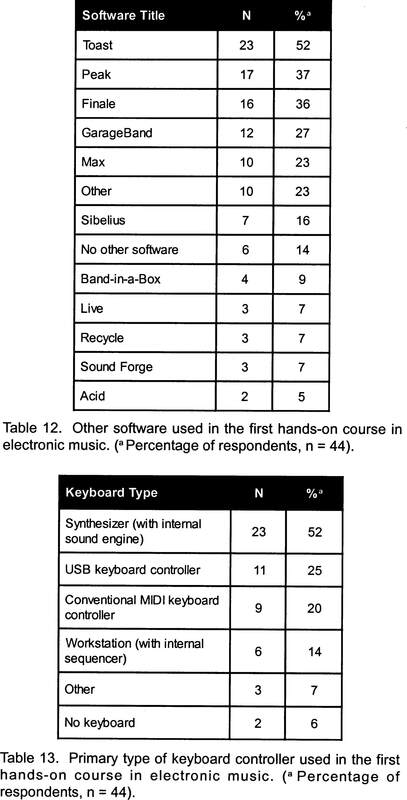 One fourth (25%) reported a USB keyboard controller, while one fifth (20%) reported a conventional MIDI controller. Six (14%) reported a workstation with an internal sequencer. Other responses included “digital piano,” “alternate controller,” and “too numerous to elaborate…from ‘silent’ keyboard to Kurzweil…still have original DX7 going strong on one station!! !” (see table 13). The final question posed was, what additional hardware is used at each computer station? 39 (89%) reported one to seven additional pieces of hardware while five (11%) reported no additional hardware. A majority (82%) reported a MIDI interface and less than three fourths (73%) reported an audio interface. Over one half (55%) reported a mixer while more than one half (52%) reported a sound module. 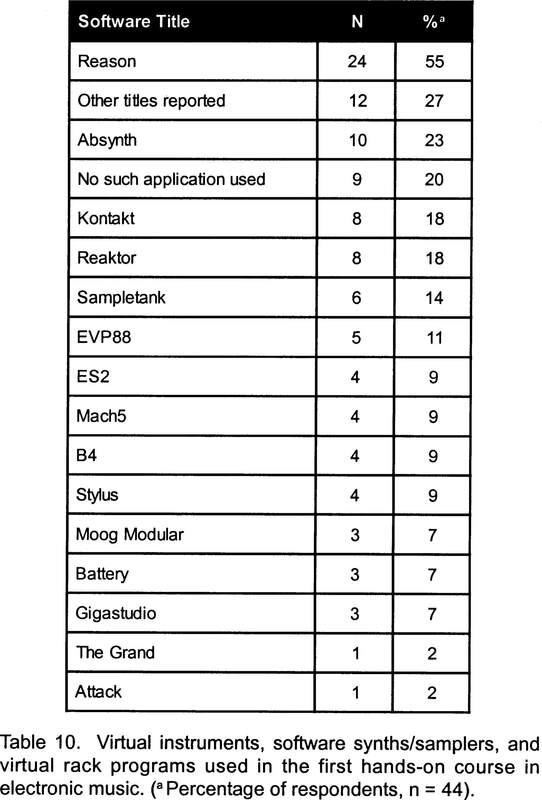 One fifth (20%) reported an effects processor, six (14%) reported a control surface, and four (9%) reported a drum machine (see table 14). When MIDI emerged in the mid-1980s, the Macintosh had the graphic capabilities conducive to music software. MIDI sequencing applications such as Performer and notation programs such as Composer ran only on the Macintosh. It was not until the mid-1990s that Microsoft Windows had comparable applications. Therefore, it was not surprising to see the majority of respondents (93%) reporting Mac OS (operating system for the Macintosh). In fact, of the nine (20%) who reported using Microsoft Windows, six of them also reported using Mac OS, and three of these reported a greater number of available stations with Mac OS. This was consistent with findings by Mager (1997) and Terrell (2001). As stated earlier, Mager reported that 81.6% of music programs used the Macintosh platform while 14.7% used Windows. Similarly, Terrell reported that 65.2% of recording technology programs used Macintosh, 8.7% used Windows, and 26.1% used both. The differences between why participants chose Mac OS or Microsoft Windows were clear. The majority of those using Mac OS reported “presence in the professional industry” as the reason. This was vital if students were to be prepared for employment upon graduation. In addition, a majority using Mac OS reported choosing it because of instructor familiarity, indicating they likely developed skills with it before becoming instructors. In contrast, a majority using Microsoft Windows reported “available resources” as the reason for this choice. This indicated they did not have a choice in an operating system or perhaps had to take what was available. Finally, unlike Mac OS users, several Windows users reported choosing Windows because of cost and technical support. It is well known that Windows is less expensive to use and more familiar to technical supporters. A digital audio workstation (DAW) application was the primary software used to turn a personal computer into a music production station. A vast majority (91%) reported the use of one or more digital audio workstations. Digital Performer was reported the most often (59%). This may be due to its prominence in the marketplace since the mid-1980s. The second most reported DAW was Pro Tools. This was not surprising considering the increased popularity of Pro Tools in the professional industry. It became an industry standard at the beginning of the twenty-first century and mastery of Pro Tools has increased the chance of employment for a student. Virtual instruments, software synths/samplers, and virtual rack programs emerged in early twenty-first century replacing costly and bulky hardware. A majority (80%) reported using this type of application, which indicated its growing popularity in introductory electronic music courses. 34 different titles were reported and the majority of them were mentioned only once or twice. This indicated a wide assortment of applications used. Nevertheless, Reason was reported most (55% of the respondents). This is not surprising considering that Reason is popular in the industry, easy to use, and includes a variety of applications. When asked to report other software, it was not surprising to see that the respondents reported Toast most often. Toast is a simple program that allows the creation of a Red Book audio CD. In addition, 18 (41%) reported notation programs Finale and/or Sibelius. This indicated that notation skills were being taught in some introductory electronic music courses. It was also not surprising to see GarageBand reported by 27% since it is included free with Mac OS. A musical keyboard is needed as a peripheral for a computer music station. A vast majority (96%) reported the use of a musical keyboard. However, the type of keyboard reported was evenly divided between those with an internal sound engine (synthesizer or workstation) and those without (known as a controller). Participants may have chosen a controller because of its lower cost. Only six (14%) used a workstation keyboard. This may have been due to the higher cost of this type of keyboard. A majority (89%) reported additional hardware. 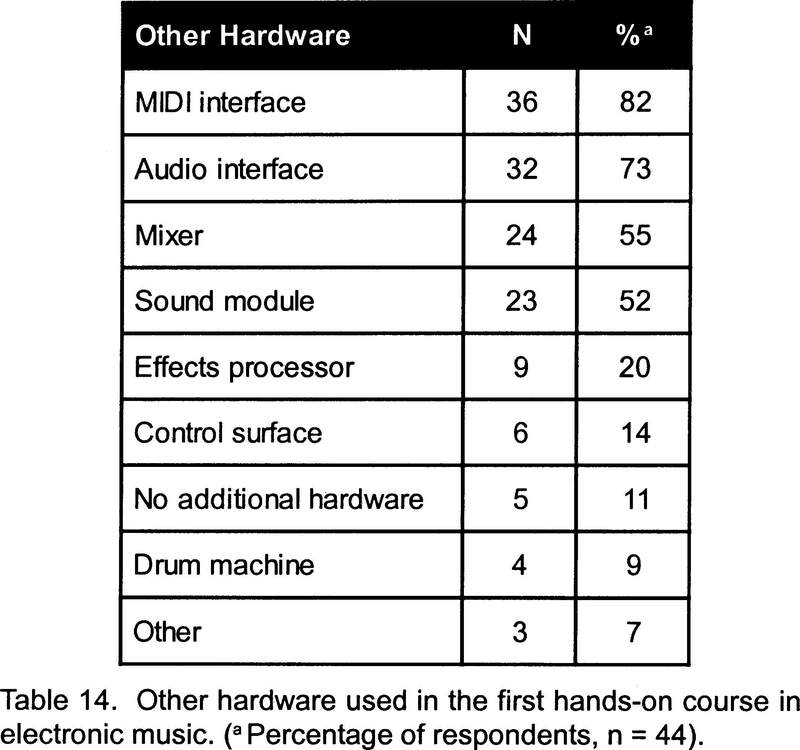 It was not surprising that the two most reported pieces of additional hardware were a MIDI interface (89%) and an audio interface (73%) as they are typically needed to send and receive MIDI and audio information to and from a computer. This study is an aid for the teacher or administrator who is responsible for electronic music facilities. One can examine the reasons the respondents chose Mac OS or Microsoft Windows. Although this study does not show the reasons other software and specific hardware were chosen, it does show the choices that were made. For future studies, it is recommended that a similar study not be limited to one electronic music course. If the study were expanded to include all courses taught in computer labs, it would indicate a broader representation of the programs. Programs have multiple courses in labs and sometimes multiple labs. This type of study would include intermediate and advanced courses. A future study could seek other information missed in this study. For example, the number of students per station during class, the purposes of choosing applications, or how the applications are used. This study was limited to the universities listed in the AES Directory of Educational Programs offering a baccalaureate degree in the United States. Other populations in the directory such as community colleges should be investigated. In addition, populations outside the directory should be investigated. Finally, if the same study is carried out at some time in the future, a comparison could be made to this one to determine changes that had occurred. “About AES.” Audio Engineering Society (2005). . Accessed 2005. Ballora, Mark. Essentials of Music Technology. Upper Saddle River, New Jersey: Prentice Hall, 2003. Chadabe, Joel. Electric Sound. Upper Saddle River, New Jersey: Prentice Hall, 1997. Holmes, Thom. Electronic and Experimental Music. 2nd ed. New York: Routledge, 2002. Huber, David Miles. The MIDI Manual. 2nd ed. Woburn, Mass. : Focal Press, 1999. Mager, Guillermo. “The Status of MIDI in the Curricula of Higher Education Institutions Offering Degree Programs in Music.” Doctoral dissertation. New York: New York University, 1997. Manning, Peter. Electronic and Computer Music. Revised and expanded edition. New York: Oxford University Press, 2004. Millward, Simon. User’s Guide to Sound Synthesis with VST Instruments. Cincinnati: Muska & Lipman Publishing, 2002. Rudolph, T. Teaching Music with Technology. 2nd ed. Chicago: GIA Publications, 2004. Rumsey, Francis. “Directory of Educational Programs.” Audio Engineering Society (2005). . Accessed July 6, 2005. White, Paul. MIDI for the Technophobe. 2nd ed. London: Sanctuary Press, 2002. Williams, D. B., and P. R. Webster. Experiencing Music Technology. 3rd ed. Belmont, Calif.: Thomson Shirmer, 2006. JOSEPH AKINS is an Assistant Professor of Recording Industry at Middle Tennessee State University. He earned his undergraduate degree from the University of Tennessee, and his graduate degrees from Radford University, Middle Tennessee State University, and Tennessee State University. At MTSU, Dr. Akins teaches courses within the production and technology concentration and is the founder for The Society for Electronic Music. He is a recipient of an Instructional Technology Award for 2004-2005. In addition to teaching and research, he produces audio CDs, scores music for picture, composes, and performs as a keyboard player.